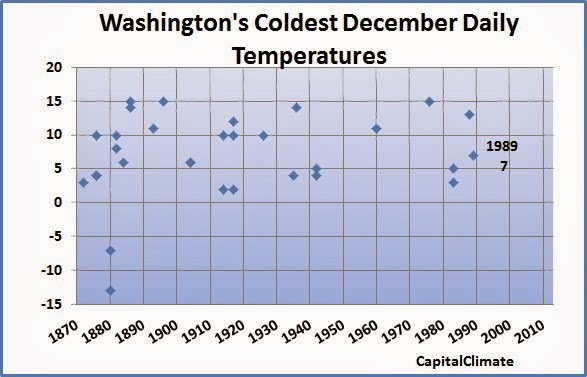 If you can remember the last time Washington, DC set a daily record low temperature in December, you've been hanging around too long in Babble-On on the Potomac. It was the first year of the G.H.W. Bush administration when a record low of 7° was set on December 23, 1989. The high of 22° that day was also a record low maximum for the date. 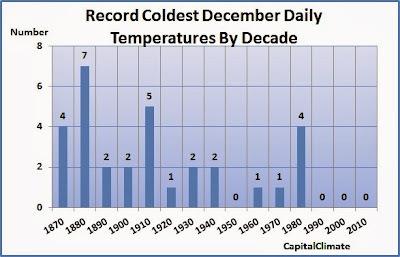 Since then, there have been no new December record daily lows in the decades of the 1990s, 2000s, or so far in the 2010s. 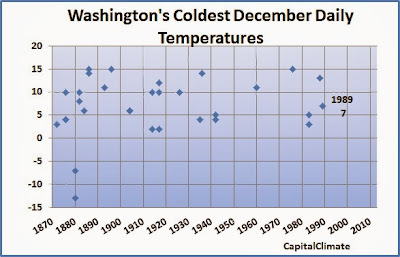 The only other decade with no December cold records was the 1950s. - Half (15) of the daily records were set over 100 years ago, from 1872 through 1904, and 2 more were set 99 years ago. - The 1880s had the most records of any decade with 7, followed by the 1910s with 5. Interestingly, all of the 1880s records occurred in even-numbered years. - Except for the 1980s (4 records), no decade since the 1910s has had more than 2 records. 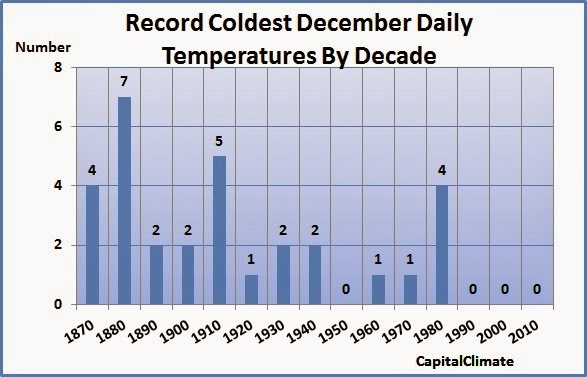 - The all-time coldest December temperature was -13° on December 31, 1880. This was just 2° warmer than the all-time Washington low of -15° on February 11, 1899. It was also a record -7° on December 30, 1880. These are the only December dates with lows below 0°.